A new bill is designed to boost electric car sales using lessons from the California Solar Initiative. Can California dramatically multiply the number of electric cars on its roads using lessons learned from the state’s solar initiative? A group of California lawmakers and industry advocates thinks so. They proposed new legislation, AB 1184, which seeks to use up to $3 billion in funds to offer larger rebates to California electric car buyers. The bill, already introduced in the Assembly (but with little in the way of actual content), is supposed to be discussed in the Senate in the coming weeks. It could go before a vote after legislators return from recess later this year. “We feel very strongly that the California Solar Initiative was among the most successful pieces of policy that the state has passed,” said Steve Chadima, senior vice president of external affairs for the clean energy industry group Advanced Energy Economy. AEE is a co-sponsor of the bill, which was introduced by Assemblymember Phil Ting. The California Solar Initiative was implemented in 2007, with a goal of delivering 2 gigawatts of solar panels on residential and commercial rooftops by 2016. The program used all of its funding years ahead of schedule and resulted in hundreds more megawatts of solar being installed than its initial goal. “It got people into the market early,” said Chadima. There were a few major lessons from the solar program: create a well-defined way to lower the incentives over time, establish a continuous funding source, and have clear objectives. The bill would create the Clean Energy Vehicle Initiative -- essentially another rebate system -- meant to bring 1.5 million electric cars to California's roads by 2025, and potentially 5 million by 2030. Governor Jerry Brown and the California Air Resources Board have long been calling for 1.5 million electric cars on California roads by 2025. Currently, there are around 300,000 electric cars driving on California’s roads, so electric cars in the state would need to quintuple in less than a decade. Few observers are confident that California will make that initial 2025 goal. The proposed rebate could add another several thousands dollars available for California electric-car buyers. The federal government already has a $7,500 tax credit for buyers, and California has a program that offers a range of rebates, worth about $2,500 for purchasers in the state. Advocates of the new bill contend that these subsidies aren’t enough for the early stage of the electric-car market. The price difference between General Motor’s Bolt and an equivalent gas-powered car is around $15,000, said Chadima. The current rebate program “isn’t enough,” and the new rebate program could “fill the gap,” he said. The second lesson from the CSI: There needs to be a clear way to lower the rebates over time as the market matures and as batteries drop in cost. As the cost of solar fell and a larger volume of solar systems were installed, the rebates in the CSI program were continuously lowered. Likewise, in the proposed electric-vehicle program, the rebates are meant to be reduced over time. “You have to create the expectation that people are not going to be eating at the public trough forever. It’s important for lawmakers and consumers,” said Chadima. Lowering rebates based on volume lets the market determine incentive levels, instead of lawmakers. The final lesson learned from the CSI program might prove to be the toughest one: the need for a continuous funding source. The CSI program used a 50-cent monthly fee on utility bills to raise $3 billion over 10 years to fund the solar rebates. That doesn’t appear to be politically palatable any longer. 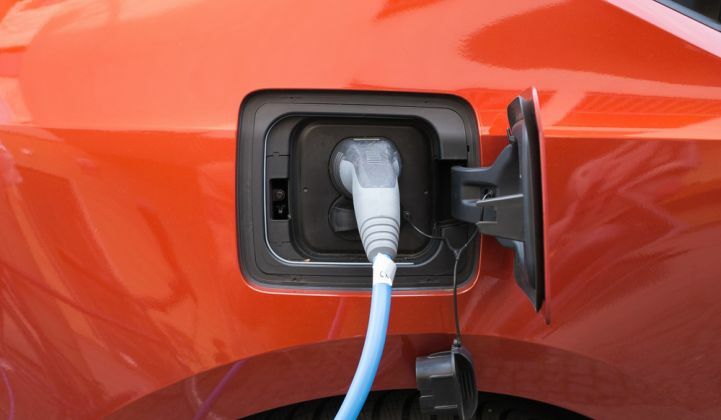 The bill would require the California Air Resources Board to find a variety of sources of funding to cover the potential $3 billion needed for electric car rebates. One of those sources will likely be the state’s cap-and-trade program; however, it's currently unclear how that program will be extended beyond 2020. Several bills seeking to extend cap-and-trade haven’t gained momentum and were not included in the governor’s recent budget. Funding sources for a variety of clean energy programs also weren't included. AB 1184 seeks to use funding sources that are not subject to annual appropriations. So in addition to cap-and-trade revenue, it would likely use some funds from greenhouse gas reduction programs. The language and details of the electric-vehicle legislation still need to be hammered out. The Senate may hold hearings on its version of the bill in the coming weeks.